NEW BRITAIN - Despite the stifling heat, New Britain defensive tackle Devon Bishop couldn’t help but hide a smile. There is plenty of optimism amongst the Hurricanes football team heading into the new season. This year has the chance to be different, the players insist. After a third straight 5-5 season, New Britain believes it has the right mixture of playmakers and depth to put those behind them and get back to winning football. Week 1 will put those beliefs to the test as the Hurricanes take on an always-solid Conard team tonight. By no means an easy task. 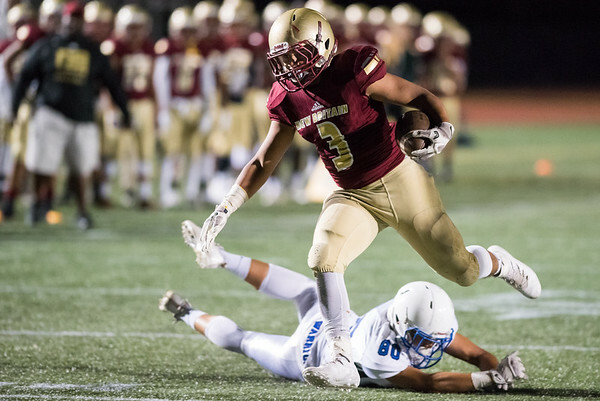 Against Conard last season, New Britain was never able to really find its footing and was constantly playing from behind despite the 30-22 final score. Mistakes, particularly dropped passes, a kick return for touchdown called back because of a holding penalty, and missed tackles cost the Hurricanes in 2017, even after a 19-carry, 172-yard performance from Shawn Robinson and two touchdowns from Kaiyon Gunn. This time around, New Britain will have to play as close to mistake free as possible against a team that tends to take advantage of an opponent’s miscues. As always, that starts first and foremost with stopping the run. Nate Bones appears to be Conard’s new starting tailback, taking over for Max Main, and figures to be a main part of the offense. The Chieftains were inconsistent at times throwing the ball last season and will once again be breaking in a new quarterback - much like the Hurricanes will be - in Matthew Langevin. Justin Furze figures to be his primary weapon on the outside. Overall, New Britain is once again expecting to see multiple formations from spread to trips to I-formation and pro. Defensively, Conard is much like its offense - versatile. As the Hurricanes’ own defense will have to prepare for different formations and looks, so too will their offense. The Chieftains play anything from a Tampa 2 to man-to-man and provide plenty of pressure if the short side of the field comes in play. It will certainly be a test for New Britain’s new quarterback. Jones has yet to officially name a starter with Tahje Yopp and Monte Dickson battling out for the spot and wasn’t too willing to give out too many details. But whoever will be under center will have a number of veteran players to rely on and taking care of the ball is a premium. The offensive line returns four starters, while the backfield has Robinson and Gunn, among others. Should Dickson win the job, he’ll have Yopp as a weapon in the passing and running game. But as always, this game will mostly likely be determined by New Britain’s ability or inability to stay disciplined, which hampered the team too many times last year. Week 1 will be a good chance to test that theory out. Posted in New Britain Herald, New Britain on Thursday, 6 September 2018 21:20. Updated: Thursday, 6 September 2018 21:23.